Maps, BUGs, Websites, Get it fixed! Description: Join us as we investigate the significance of the first flight by Harry Houdini exactly 100 years ago. We will ride along the Melton- Keilor Highway to Plumpton Road and then to the plaque commerating Houdini’s achievement. Then it is on to the Houdini Festival of Flight run by Melton Shire council at the Diggers Rest Recreation Reserve in Plumpton Rd. Lots of entertainment and activities from 11 am till 4 pm. Stay as long as you please. Report: 10 riders enjoyed a very pleasant ride to the plaque for a photo stop and then on to a very imaginative festival by Melton Shire Council for more photos with some very antique bikes. A swift tail wind carried us home. Description: Meet at the Woodend Tourist Information Centre, Woodend, for this undulating country road ride to Daylesford via Tylden and Trentham. We shall stop for breaks at Trentham and Lunch at Daylesford and then return via the same route. A good training ride for the half Round The Bay! Report: 5 riders braved a cool, damp and definately windy day. Starting at the Caltex service station in Kealba (Melways ref. 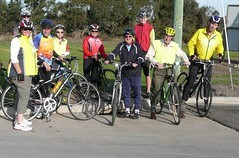 26 H2) we ride along the Western Ring Rd bike path to Jacana Reserve to Broadmeadows Valley Park path to Craigieburn. Then we ride through Craigieburn to the bypass, down the Craigieburn bypass path to the service station on Cooper St where we stop for lunch. We then continue on the bypass path to the Western Ring Rd path through Jacana and back to the starting point at Kealba. It was a good ride, with 11 cyclists. You are currently browsing the archives for the Ride reports category.